Look like sharks to you? Okay. I've been trying to look for answers all over and haven't been able to find anything. I have 3 sharks in my tank, Redtail shark, Rainbow and Rose line shark. but the Rainbow shark would chase the Redtail shark around. They did this for awhile and now they just hang around each other all the time and won't leave the weeds that are in my tank. Is this normal or should I be worried? Here's a picture if you can make it out. hey guys, i just recently baght a bala shark for my tank. but i also have a rainbow shark in there. 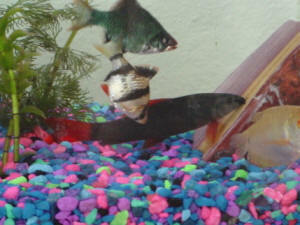 the rainbow shark is being very territorial and is chasing the bala shark all over and nipping at him. shus i just take the bala shark back or will they eventually be ok with eachother after a few days? thanks, chris. Hi, my name is Leigh. I got a Rainbow Shark (male) a few months ago and lately I've been having some problems with him. I've read through your FAQ's and other sites but couldn't find anything on my problem. Ever since I've had the shark he's never bothered any of the other fish in an aggressive way, he'd swim with my Gourami and angel and only charge the other fish if they got in his way. But lately he's become very aggressive and has been rubbing the rocks and decorations in the tank. I heard that adding more hiding spots and plants to a tank will calm the aggression of fish, so I did but it only made him worse. Now he only lets the Gourami and angel hide in them, chasing the other fish out if they go in them, and will go to the other side of the tank to chase the fish, especially my Danio. I thought maybe the rubbing was from 'ich' based on the facts I read about it and dealing with previous cases on the fish I had before, so I've been doing treatments for it but its not helping. He's eating normally and my water levels are all normal and I do a 20% water change every week. Do you have any ideas or advice on what this might be? I care a lot about this fish and I'm really scared something might be seriously wrong with him. 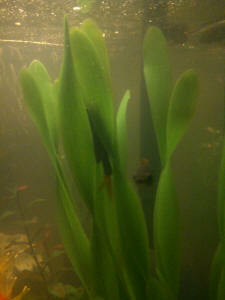 If I lost him I would be devastated since he's done some things I've never seen fish do. By that I mean, if I'm fixing something in the tank he'll swim into my hand and when I pull my hand out of the tank he swims around the top until I put it back in the water. Is that a sign that somethings wrong with him or something else? Thanks WWM, I'm really hoping you can help me.